AUGUSTA, Maine — Republican U.S. Rep. Bruce Poliquin of Maine’s 2nd District steeply outraised the rest of Maine’s congressional candidates by March’s end, but one of his Democratic opponents used ties to a rising congressional star to widen a money lead over the rest of the primary field. Poliquin, a Republican from Oakland going into his second re-election race in a district being targeted nationally by both parties for the third straight time, took in more than $2.6 million as of March’s end, according to documents due Sunday to the Federal Election Commission. 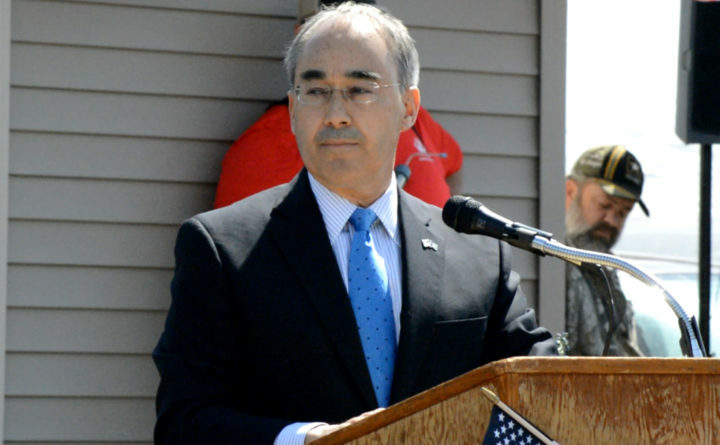 Just under half of Poliquin’s money came from political committees. His haul is $1 million more than the combined totals raised during this cycle by U.S. Rep. Chellie Pingree, a Democrat from Maine’s 1st District, and the five party candidates running to oust both incumbents. Four Democrats are running in the June primary for the nomination to take on Poliquin, with Assistant Maine House Majority Leader Jared Golden of Lewiston and conservationist Lucas St. Clair of Hampden distinguishing themselves in the money race so far. Golden raised more than $618,000 by March’s end, and St. Clair raised $425,000 over the same period. But the two Democrats have $308,000 and $196,000 left unspent, respectively, while Poliquin has spent only about 15 percent of his money and has more than $2.2 million left. Golden, a second-term state representative and a Marine veteran of the Iraq and Afghanistan wars, received more than $53,000 from a fundraising arm of the Serve America PAC. That group is led by U.S. Rep. Seth Moulton, D-Massachusetts, a Marine veteran who helped recruit Golden and is boosting veteran candidates across the country. Two-time Maine Senate candidate Jonathan Fulford of Monroe, who is also running for the Democratic nomination in the 2nd District, has raised $167,000 with $85,000 unspent. Islesboro bookseller Craig Olson raised $100,000 with $42,000 left. All of their money has come from individual contributors. In the 1st District race, Pingree, a fifth-term incumbent, raised $273,000 as of March’s end, but she has $602,000 available — much of that from previous races. Republican counselor Mark Holbrook of Brunswick has raised $45,000 in his rematch bid with Pingree, who easily beat him in 2016.